The Washington Post is not the first. 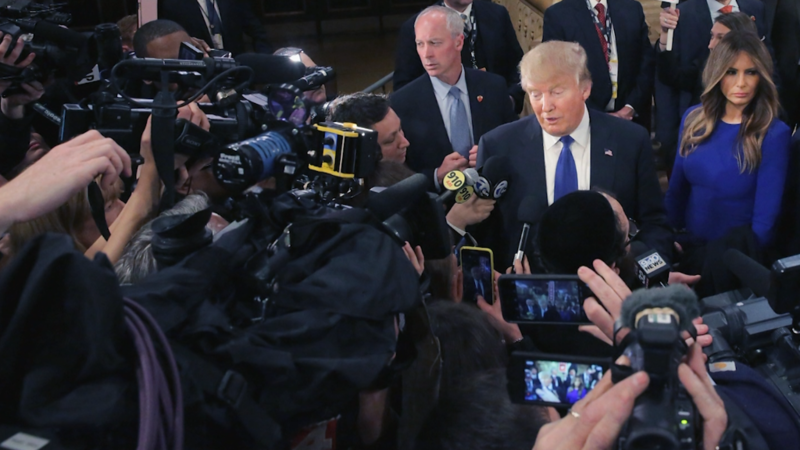 Donald Trump has been denying press credentials to news outlets for nearly a year. It's become known in media circles as "the blacklist" -- a running catalog of newsrooms deemed by Trump to be unfair and banned from his campaign events accordingly. The list includes an assortment of digital outlets, the largest Spanish-language broadcaster in the country, a premiere local newspaper and -- now, with The Post -- one of the most prestigious news organizations in the world. In some cases, reporters from the offending outlets can still attend Trump campaign rallies as members of the general public, but without the access and privileges that press credentials provide. In other situations, like press conferences, the reporters cannot attend at all. Trump campaign spokeswoman Hope Hicks declined to comment for this story, but aides have previously said the practice of banning certain reporters is a logical response to what they consider to be unfair treatment. But a wide array of news media advocates have condemned the behavior and expressed concern that it could have a chilling effect on other outlets' coverage of Trump. The Clinton campaign does not have an equivalent pattern of revoking press credentials. · Univision was first banned by Trump due to the candidate's litigation against the company last summer. His $500 million lawsuit was prompted by Univision's decision to cancel the broadcast of Trump's Miss USA pageant. The two sides settled the lawsuit in February, but Univision's access has still been limited. A spokesman for the Spanish-language broadcaster said that reporters there have only been granted credentials twice. Most of the time, Trump's aides ignore Univision's requests, and if the campaign does respond, it's typically to say that the request was too late, the network says. · BuzzFeed was probably doomed before the campaign even started. In 2014, political reporter McKay Coppins penned a lengthy profile of Trump that infuriated the former reality TV star. Now that he's followed through on his White House bid, Trump has gotten revenge on BuzzFeed with a steady denial of access. Editor-in-chief Ben Smith said the site's reporters have "never been credentialed," and have been routinely turned away from Trump events throughout the campaign. "I think McKay's profile holds up extremely well, and I'm proud that we've chosen not to compromise our coverage in any way in exchange for access," Smith said. · Politico found itself on the "blacklist" back in March when reporter Ben Schreckinger was denied entry to a Trump press conference in Florida. The campaign never provided an explanation, but Schreckinger was denied after writing a story about concerns surrounding the temperament of Trump campaign manager Corey Lewandowski. Schreckinger had a similar run-in earlier this month when he was ejected from a Trump event in California by a campaign staffer and private security guard. The reporter attended the event with a general admission ticket because he had already been denied a press credential. It apparently goes beyond Schreckinger. Politico editor Susan Glasser said that the site's journalists "have repeatedly been denied credentials by the Trump campaign." "We now appear to be subject to a complete blacklist," Glasser said. "We believe this is nothing more and nothing less than an attempt to stop independent coverage of the campaign and steps on the basic rights of journalists to exercise their constitutionally protected role in our political system." · The Daily Beast has been subject to what Noah Shachtman, the executive editor, calls a "slow rolling blacklist." "We were never a Trump favorite, but things got very frosty after we published a story last year about allegations that Ivana Trump made and later walked back about Donald Trump," Shachtman said. Tim Mak, who wrote the story, "was the first of our reporters to be cut off," he said, and "by the time the New Hampshire primary rolled around, even our freelancers were getting cut off." Like the other news outlets on this list, The Daily Beast continues to cover the Trump campaign without receiving press credentials for events. 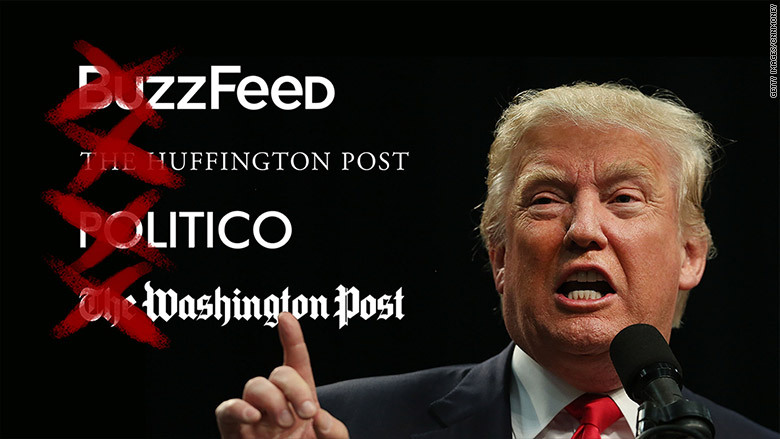 · The Huffington Post has seen its reporters shunned by the Trump campaign from almost the beginning. The liberal-leaning news site infuriated Trump when it placed all coverage of his campaign in the entertainment section. Last July, Trump's campaign stop credentialing Scott Conroy, then HuffPost's senior political reporter. In September, a reporter covering the GOP primary for HuffPost was denied credentials at a Trump campaign event in Iowa. HuffPost stopped covering Trump in the entertainment section in December, but the campaign's credential ban has persisted. It's safe to predict it will continue now that the site has hired Michelle Fields, who had Trump's campaign manager charged with battery, to cover the presumptive GOP nominee. "None of us get credentialed," Grim said at the time of the hire last month. "I assume that'll be the case for her." · The Des Moines Register traditionally plays an outsized role in presidential election coverage, given its status as the preeminent newspaper in the important state of Iowa. But with the 2016 campaign just getting warmed up last July, the paper was denied press credentials to a Trump event. The Trump campaign didn't dance around the reason why. That same week, the Register had published an editorial calling on Trump to drop out of the race. "We're not issuing credentials to anyone from The Des Moines Register based on the editorial that they wrote earlier in the week," Lewandowski said in a statement at the time. Amalie Nash, executive editor and vice president for news and engagement at the paper, said Tuesday that the ban "continued throughout the duration of the caucus cycle. We were never granted credentials to another event after publishing this editorial last July." Since Trump has not been back in Iowa, "we haven't had occasion to apply for credentials since the caucuses," Nash said.